have imagined the change that would come when her University of Washington sorority sponsored a dance to support troops sent to Alaska to protect against Japanese invasion. She danced with her soon-to-be husband but was not initially interested. However, his subsequent letter describing what would have been their first date, tipped the balance. Helen was the first born American in her family. Her English born father and Canadian born Belgian mother immigrated from Canada to the US after WWI and settled in Seattle, Washington where she was born. Her father was a clothier and her mother was a nurse. She had two sisters Odette (Larry Davis), and Billy Anne (Charles Vinup). She attended Seattle public schools and was graduated from Roosevelt High. She studied nursing at the University of Washington for three years but her studies were cut short by the war, and ultimately, by her eventual marriage to Wilford Rene Richardson in Mesa, Arizona on October 2, 1943.
sealed to her husband on May 1, 1946. Helen lived a busy and industrious life as a loving wife and consummate mother. In addition to raising her six children, Ed (Brenda Brimhall), Lynne (Robert Jones), Nicole, David (Janet Barney), Bill (Debbie Johnson) and Kathy (Brad Farber), she engaged in oil painting, woodworking, upholstery, and even owned her own drapery business. 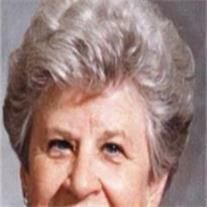 Helen was faithful member of the church her entire life and held many positions of authority. She was preceded in death by her parents William F. Kennedy and Lea Coupez, her sister Odette Davis, and by her son, David. She is survived by her husband of 67 years, five children, 26 grandchildren and 31 great-grandchildren. Visitation will be Thursday, April 21 at Bunker’s Garden Chapel, 33 N. Centennial Way in Mesa from 6 to 8 and beginning at 9:30 a.m. at the Solomonville Chapel on Saturday April 23. Funeral services will commence at 11:00 a.m. with a burial at the Safford Cemetery thereafter.